Although the number is not immediately available of the economic development corporations in Texas which had been paying property taxes, there are more than 700 nonprofit corporations in Texas which collect and administer their respective one-half cent economic development sales tax. The new law goes into effect on September 1. The Edinburg Economic Development Corporation, governed by a five-member board of directors which features the mayor as president, is led by EEDC Executive Director Agustín “Gus” García, Jr. (no relation to the mayor). The payoff for the EEDC, which derives much of its revenue from the local one-half cent economic development sales tax, will be significant, said Gus García. The EEDC executive director took his findings to the city’s top elected and appointed leadership, seeking their support to have state legislation filed to resolve the controversy. As soon as he was given the go-ahead from the mayor, city council, and EEDC Board of Directors, “Terry (Canales) and I were on the phone discussing the matter,” Gus García said. The Hidalgo County Appraisal District, the government entity headquartered in Edinburg, whose powers include determining the market value of taxable property, has the authority to rule on exemptions and special valuations authorized by local entities and the State of Texas. Rather than wait until legislation could be filed, Gus García convinced the Hidalgo County Appraisal District to determine that the EEDC did not have to pay property taxes after all. But the uncertainty of the language in state law meant that legal challenges could still be filed against appraisal district’s action favoring the EEDC, so the Canales’ legislation – House Bill 2305 – would still be needed, Gus García contended. “When the statute was written, it left room for a taxing districts to make the determination based on a number of criteria, after further investigation, it became clear to me that we could easily clear the ambiguity of the law, by simply amending the statute through our local state representative,” Gus García continued. 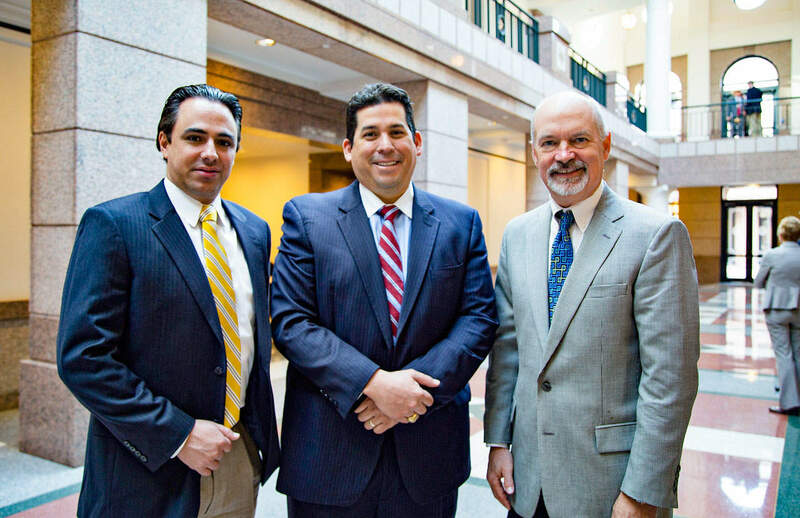 With the help of René A. Ramírez, owner of Pathfinders Public Affairs, which is the EEDC’s state legislative consulting team (and one of the few legislative consulting services based in the Valley), the Canales’ measure was coordinated for drafting and filing for action by the Texas Legislature in early spring. On Thursday, March 12, Canales filed HB 2305 seeking to exempt the Edinburg Economic Development Corporation – and a result, dozens of other EDCs statewide – from paying property taxes. On Tuesday, March 17, HB 2305 was referred to the House Ways & Means Committee. But the measure remained stalled before the House Ways & Means Committee, with the necessary committee public hearing never being scheduled because that House panel was overwhelmed with 394 other bills requesting action. Only 158 out of the 395 bills referred to the House Ways & Means Committee made it out of committee. Many, if not most, of those never made it far enough in the legislative process to become law. As Canales worked on dozens of other major issues, ranging from setting up a branch campus of South Texas College in the Delta Region to helping secure almost $100 million in new funding for the University of Texas-Rio Grande Valley and its School of Medicine in Edinburg, the state lawmaker kept a sharp eye on amending other state legislation to include the goals of HB 2305. An amendment involves adding new language to a bill, which is an especially difficult challenge on the House or Senate floors during the final days and hours of the legislative session. But Canales was tracking House Bill 1905 by Rep. Drew Springer, R-Gainesville, which proposed eliminating certain other state and local taxes, and HB 1905 was almost certain to beat the legislative deadlines. Gus García said the EEDC has a long and triumphant history of acquiring land for development and job creation, pointing to two of its more famous success stories. Owassa Business Park, Renaissance Industrial Park, Airport Industrial Park, and La Sienna Industrial Park also are also developed and marketed by the EEDC. Since the adoption of the Development Corporation Act (the Act) in 1979, Texas law has allowed cities to form economic development corporations (EDCs) to attract businesses and create job opportunities. The Legislature amended the Act in 1989 and again in 1991 to allow eligible cities to adopt dedicated sales and use taxes to fund EDCs. In 2009, the Act was recodified to Chapters 501-505 of the Local Government Code . With the recodification, EDCs formerly known as 4A and 4B corporations are now referred to as “Type A” and “Type B” corporations, respectively . The Type A sales tax is essentially limited to funding industrial and manufacturing facilities, research and development facilities, recycling facilities, distribution centers, small warehouse facilities, military facilities, job training, targeted infrastructure, regional or national headquarters facilities, business airport facilities and port-related facilities. Expenditures for targeted infrastructure must be related to an authorized activity under the act. The statute also allows a Type A corporation to undertake most Type B projects without having to change from a Type A corporation to a Type B corporation. To do so, the city council must publish notice, hold a public hearing and obtain voter approval. Voter approval is not required if the Type A corporation is located in a city that also operates a Type B corporation and has a population of 7,500 or less. At the end of fiscal 2013, 216 cities had adopted the Type A economic development sales tax. A Type B sales tax allows greater flexibility in expending revenues. Generally, allowable Type B expenditures include not only those available under Type A, but also projects that contribute to the quality of life in the community, such as park-related facilities, professional and amateur sports and athletic facilities, tourism and entertainment facilities, affordable housing or other improvements, or facilities that promote new or expanded business enterprises that create or retain primary jobs. At the end of fiscal 2013, 492 cities had created Type B economic development corporations. The Act requires a city that adopts either or both of these funding sources to establish a development corporation to administer and oversee the expenditure of the sales tax proceeds. A board of directors, whose members are appointed by and serve at the pleasure of the city’s governing body, oversees the development corporation. A city must deliver sales tax receipts derived from the sales tax for economic development to the EDC upon receipt of the funds from the Comptroller’s office. The corporation’s board of directors is responsible for all decisions regarding the use of these revenues and the projects undertaken. However, the city council retains final oversight authority and must approve of all programs and expenditures of the corporation.